Our 2014 church camp was held in Everly Hotel in Putrajaya. 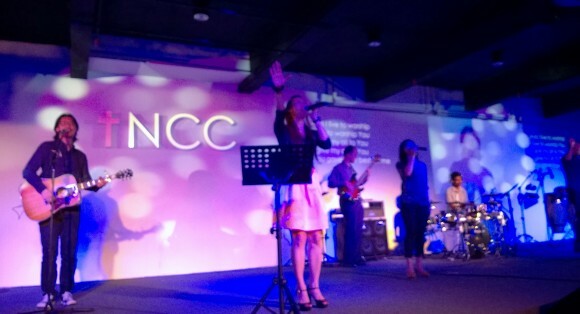 I decided to visit my favourite church in Petaling Jaya, the New Covenant Church. 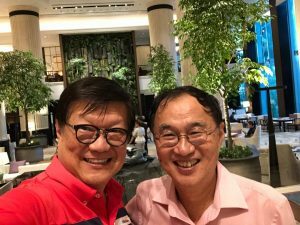 My friendship with the pastor, Peter Sze, was started and maintained by social media via this blog and Facebook. I have been a keen observer of this grace-based church that has taken Joseph Prince’s melody of grace and made the song uniquely theirs. It has been nothing short of amazing what God has done, and I have been observing the development of this young church since its formation. You can read the various posts I have written by doing a search on the top right hand of this blog. On Friday afternoon while church campers went home to Singapore a Mercedes Benz shuttled me and my wife off to the pastor’s home where we received a warm welcome from Seefen, the pastor’s wife. Pastor Peter is a managing director of a company and flew back from Singapore late in the afternoon. By around six, he and his wife had to go launch a new community group of the church. Running a company and leading a church requires bi-vocational stamina and passion. Meanwhile we were brought out for an evening meal in IPPUDO at the Bangsar Shopping Centre. Filled up with ramen and pleasant conversation with Yew Juan and Suzanna (the pastor’s daughter), we then had dessert at a kopitiam: roti tissue tower, teh tarik, and chendol – calories for tomorrow’s hike, that’s how we justified our intake. It was about seven in the morning on Saturday when we got ready and went for the morning’s hike up Bukit Gasing (literally “hill top”). The hill is located on a narrow sliver of green, smack in between Kuala Lumpur (federal territory) and Petaling Jaya, a city of Selangor. 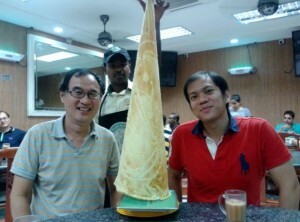 At 160 metres tall it is the small brother of Bukit Timah Hill’s 163 metres. There was a group of hikers from the church who regularly hiked here. 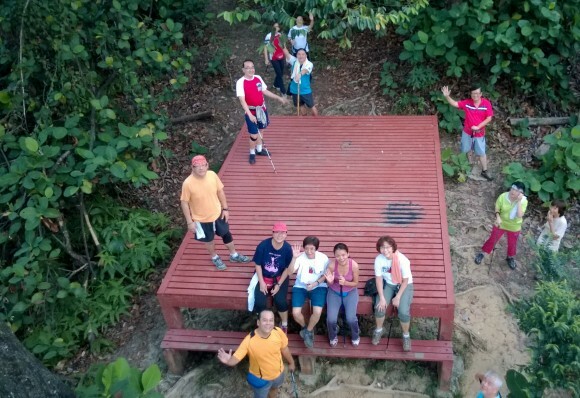 Many had climbed Mt Kinabalu recently and some had stories of weight loss and better health as a result of regular hiking. We enjoyed the hike. It had interesting features like a watch tower, a suspension bridge, and various detours from the main route. One of the steeper slopes was tougher than the toughest slope in Bukit Timah Hill. It was a good workout and we adjourned for breakfast with the group while Pastor Peter had to rush off for a meeting with his leaders. He was busy but had accommodated our desire to hike. If not for us, he would probably have had opted for sleep, glorious sleep. That afternoon we talked shop over lunch and coffee at One Utama. The New Covenant Church used to have a mid-week fellowship that meets for teaching of the word and small group interaction. Now in addition to this they have developed home fellowships for the caring and belonging of community. I thought this was an important development for as the church grew to its current 600 in attendance, feeling a sense of belonging can be easily lost. These home groups that met fortnightly for fellowship are spread over more locations, making it convenient for members to attend. The increase of such groups will certainly increase body ministry and participation, develop shepherds and leaders, and give the church a greater capacity to assimilate and initiate new guests or converts into the life of grace. It will lay foundations for further growth in grace and knowledge of the Lord Jesus. Another interesting development I got wind of was the formation of the TNCC Educenter. The stated mission was to provide an education alternative for young people at affordable costs. They use a programme called Eduseeds. It is multimedia-based online learning combined with classroom interaction. It is done at the pace of the student. And it prepares students to sit for the Cambridge IGCSE. It is done as a community service too. Pastor Peter shared how the Lord opened the door for them to start this and provided the right contacts, champions and students. On Sunday I saw the large auditorium that tNCC uses for its worship services. This was their third one and it seated 800. I preached there on the new covenant way of finishing well, and gave an invitation for sick people to be prayed for with the laying on of hands. Nowadays, I find that my doctoral research on ageing and spirituality have crept into my preaching and writings. I guess this is inevitable and I do not mind if that is relevant to the text my message is based on, which it was, as I spoke about the biblical Caleb, that senior with great faith, and how he finished well. I couldn’t book a return bus ticket for Sunday and I asked Aileen, who attended our church when she lived in Singapore, for help. She invited us to stay in her home on Sunday and book a ticket on Monday morning. 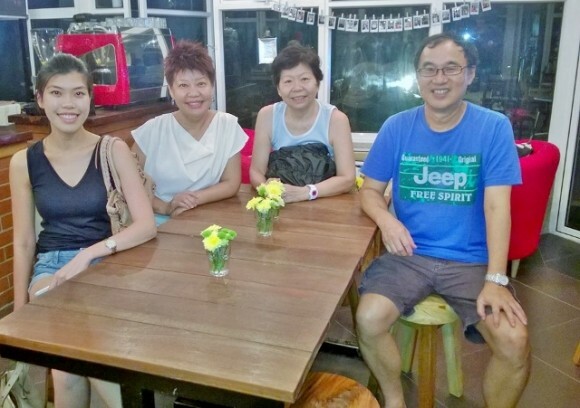 We had a lovely crab dinner near her place and then we visited her daughter’s new start-up café. It was in a glass house situated in a university, and we loved the coffee, lava cakes, macaroons and decor. On Monday morning, we slurped up fish porridge at a local coffee shop, and left for Singapore on First Coach at One Utama. What an enjoyable and blessed weekend of ministry, fun and fellowship. This video is probably the best parody video done by a church of the Gangnam Style. The New Covenant Church of Petaling Jaya cooked up this fun and creative video for its 3rd anniversary celebrations. I saw it today and it put a smile on my face because there are people in it that I know and the Malaysian PSY lookalike is just fabulous in his cheeky movements and facial expressions. The lyrics of the rap “the tNCC style” are shameless and ingenious advertising. Enjoy and may it brighten up your office Monday blues! To know more about the New Covenant Church click HERE.